receive project updates and event notifications, subscribe below! Nearly a dozen homes have started construction at Fairways with the first residents set to move into their new golf course community in May. The Display Village Precinct will see several new builders homes completed around the same time ready for opening in June. Golf course designer Karrie Webb has been on site recently, inspecting works on the golf holes around the residential development that are due to commence construction December 2014! 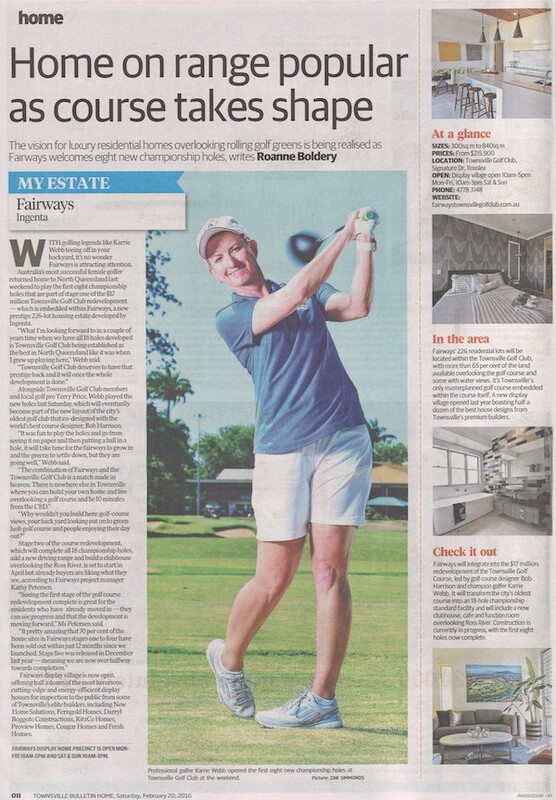 Karrie confirming she will also be one of Fairways residents enjoying the best of both worlds...golf course views and inner-city living! This article appeared in this month's UDIA Urban Developer magazine about Fairways and Envirodevelopment. The Building Design Guidelines & Covenant is designed to enhance the quality and liveability of Fairways and offer you peace of mind that your investment within fairways is secure by committing all land owners to a high standard of housing, landscaping and streetscape. Fairways encourages smart design of energy efficient homes that suit our North Queensland climate, reducing your living costs and improving the overall comfort of your new home.